Samsung, at the Unpacked event in New York City, announced the much awaited Galaxy Note 9, and this is right now the best smartphone that Samsung makes. Talking about the number of leaks and rumors, it won’t be wrong to say that the Note 9 was on the top of the list. All the leaks and rumors started from the beginning of 2018 and finally came to an end today, as the phone is now official. Just like last year, the Samsung Galaxy Note 9 is not a very significant upgrade from this year’s Galaxy S9+. The main highlight of the Note 9 is its massive battery and the all-new S-Pen. The design isn’t something new since the Note 9 looks almost the same as last year’s Note 8. The Note 9 comes with the largest display that we have ever seen on a Note device. It’s a 6.4-inch panel, which is just 0.1 inches bigger as compared to the display of Note 8. It is the same Quad-HD+ Super AMOLED display, and we all know that when it comes to smartphone displays, Samsung is still the best. The display supports HDR10 & has a resolution of 1440×2960 pixels. The Note 9 looks almost similar to the Note 8 from the rear except for the fact that the fingerprint scanner is now placed below the camera module, which may not be the best place to put it on such a big device, but is certainly a better placement than the fingerprint scanner on Note 8. Also, the camera module now has the same color as the phone, unlike Note 8’s camera module that had a fixed black color, no matter which color the phone had. Except for the Ocean Blue Note 9, all the three color variants have S-Pen with the same color. 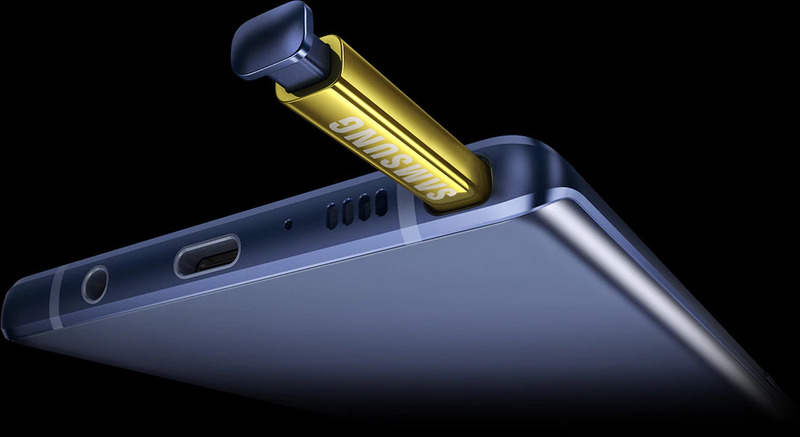 The Ocean Blue Note 9, however, has a Yellow S-Pen. Just like the previous generation, Samsung hasn’t ditched any of the ports, and so, we have the USB Type-C port, as well as the 3.5mm headphone jack present on the Samsung Galaxy Note 9. The position of the buttons remains unchanged. Just like Note 8, the Galaxy Note 9 is IP68 certified for dust and water resistance. The Note 9 also packs stereo speakers tuned by AKG. Powering the Note 9, there is the 10nm Qualcomm Snapdragon 845 / Exynos 9810 chipset, along with the Adreno 630 / Mali-G72 MP18 GPU. The Galaxy Note 9 comes with 6/8GB RAM along with 128/512GB internal storage that can be expanded via microSD card up to 512GB. So, you can have up to 1TB of storage with this device if you go for the 8GB + 512GB variant. Just like previous Samsung flagships, there is a hybrid SIM slot that means you can either go for a single SIM and a microSD card or two SIMs but no SD card. Looking at the storage, however, it looks like there won’t be a need for the microSD card unless you are a guy who stores a ton of music, movies, TV shows etc on your phone. One of the major cons of the last year’s Note 8 was its battery. The Samsung Galaxy Note 9 has a big 4,000mAh battery under the hood, which is the biggest that we have seen on any Note device so far. The phone supports Quick Charge 2.0 (Seriously, Samsung? )and the Adaptive Fast Charge. The Note 9 also supports Fast Wireless Charging. Let’s now come to the cameras on the Galaxy Note 9. There is a dual rear camera setup that remains unchanged from the Galaxy S9+. So, we have a SuperSpeed Dual Pixel 12MP primary rear camera with a variable aperture (f/1.5 and f/2.4) and Optical Image Stabilization. The secondary camera is a 12MP telephoto lens with 2X optical ZOOM, f/2.4 aperture, and Optical Image Stabilization. On the front, the Note 9 has an 8MP camera with f/1.7 aperture and Autofocus. 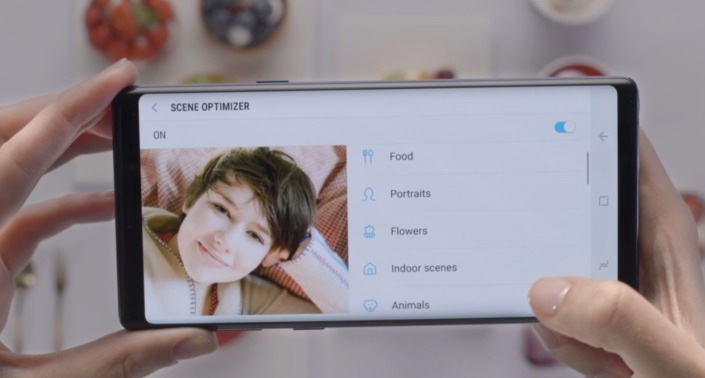 There is a new Scene Optimizer feature for the cameras that is similar to the Scene Recognition that we see on most of the Android phones with AI cameras. This feature uses the Deep Learning technology to identify the type of scene. Then, the color tones are adjusted as per the scene. 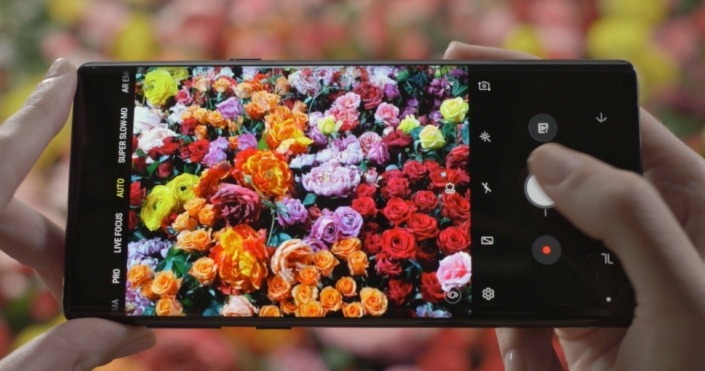 At the moment, the cameras on Note 9 can identify 20 types of scenes including Food, Flowers, Landscapes etc. Then, there’s the Flaw Detection feature that detects flaws like Blink, blur or light behind the subject etc. If there are any such flaws, this feature will notify the user so that he can snap the same image again but this time, with no flaws. Just like the Galaxy S9+, the Note 9 can shoot 960fps Super Slow Motion videos. With this feature, the 0.4 seconds of footage turns into 12 seconds of Super Slow Motion footage. The software automatically adds a background song to the captured footage to make it more epic. Speaking of Epic, Fornite for Android was also announced at the same event and from Thursday, users having the Samsung Galaxy devices including the Note 9, S9, S9+, Note 8, S8, S8+, S7, S7 Edge, Galaxy Tab S4, and Galaxy Tab S3 will be able to download and try the Fortnite Beta. The game will be available to download from Samsung Game Launcher as well as the Epic Installer. The Note series from Samsung is known for the S-Pen as well, and with the Note 9, the S-Pen got a lot of new features. For the first time, we have an S-Pen with Bluetooth support, which can be used for a lot of things like spanning photos or moving between presentation slides etc. The S-Pen can be charged in just 40 seconds, and the charging process is quite simple. Just put it back in the phone and leave it there for 40 seconds. This charging is needed only for the Bluetooth related features to work. Rest of the features like Memos etc. work without any need of charging. Unlike the Note 8, you will no longer need a separate DeX Dock for all the DeX related features. With the Galaxy Note 9, all the DeX related functionalities are built in, and so, you only need a cable to connect the device to an external display, and that’s it! You can then use it has a keyboard and mouse as well. Other features include Android 8.1 Oreo, NFC, Bluetooth 5.0, LTE Cat.18, Iris Scanner, Facial Recognition and not to forget, AR Emojis. In the UK, the pre-orders are starting from August 9 and the shipping will start from August 24. The color options are Midnight Black, Lavender Purple, Ocean Blue and Metallic Copper.